Pours a cloudy pale copper with a rich white head. Classic Hefewiezen notes on the nose. Rich caramel malts with notes of citrus banana and a hint of clove. 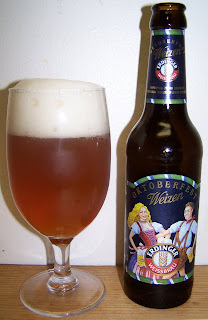 This is labeled an Oktoberfest but it is a Hefe so this should be an interested beer. Lets dive in and see what it taste like. This is a good hefewiezen. I’ll have to compare it to there regular Hefeweizen to see what else this one has. I did expect richer caramel malt flavors then what I’m getting. But I do like what this beer has to offer so far. Light and smooth caramel malts up front then a clean hop drying effect without the hop bitterness and then the classic somewhat spicy Hefe finish. I have had this beer before at a tasting but you never really experience a beer until you fill a glass and let it develop. This is one of the excellently crafted beers that I just want to keep nursing. It’s now at 72 degrees and it’s just as good if not better then it was when cold. It’s not as flavorful as Ayinger Oktoberfest but this is still an excellent beer. Another great German beer that is good to the last worm drop. This is an A for me, just an excellent Hefeweizen.